I have been a teacher of children with a range of SEND for 5 years since qualifying in 2013, more recently, including children who have visual impairments (VI). I currently teach children and young people aged from 11 to 19 and am nearing the end of my degree course to gain my Qualified Teacher of the Visually Impaired (QTVI) status. As a new practitioner to the field of VI I am always looking for pupil led resources that make a difference to the lives and learning of my pupils with a VI. I was offered the opportunity to try, and review, Positive Eye’s Easier-Easier Posting Box earlier in this academic year. The premise is simple, but powerful: The children and young people sort a range of statements relating to school life into things that they find easy and things they would like to find easier, promoting pupil voice. The language chosen by Gwyn McCormack (the creator of Positive Eye Ltd) is motivating, as rather than suggesting it is something that the child can’t do, or finds ‘hard’ the language used suggests that the child is working hard at this but feels that they could be supported better, putting the responsibility firmly on the adults! The aim of the resource was, for me, to enable the young people that I work with to ‘be heard’ and, in turn, to make improvements for the well-being and teaching and learning of the individual pupils in my care. 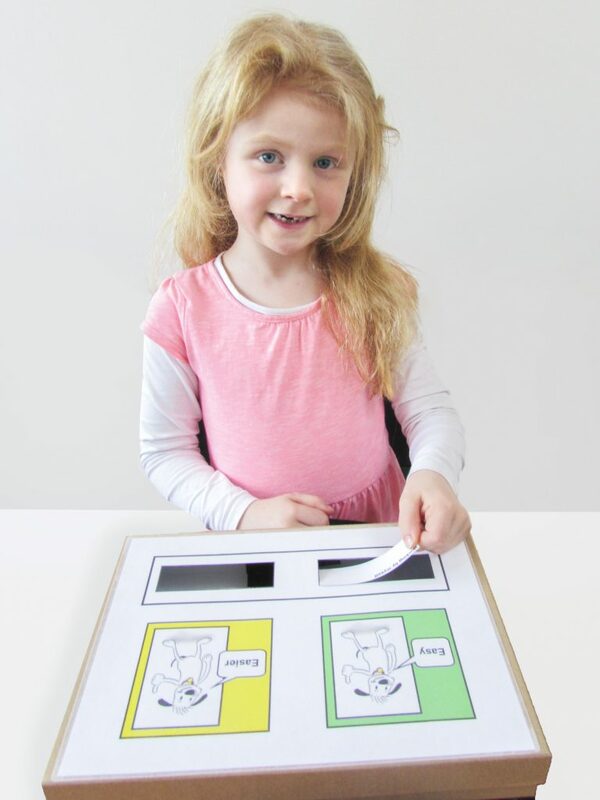 The posting box is incredibly child friendly, and is easily adaptable for braille users and large print users. The statements included with the resource are user friendly and encompass all aspects of school life and learning, from social skills such as “finding my friends at play time” to subject based cards from Art to Computing. All of the statements do not need to be used each time, it may be that you have a focus on social skills and use the statements relating to this, likewise if you are working with a Primary child, some of the subject based learning cards may not be appropriate, but the range of statements included enable all ages of children and young people to be heard. The pupils that I used the resource with, including a Braille user and an N48 print user, all really enjoyed completing the activity! They saw it as a game and once I had explained what they needed to do they were able to complete the task independently and, more importantly, honestly. This lead to conversations with the young people about how we, as a school, could help make it easier for them, making their voice and opinion feel valued. It has enabled me to act as the ambassador for the young people in my setting, making meaningful changes for each individual and directing funding for resources in a way that enables learners with VI to access lessons that they identified as wanting to find ‘easier’. The Easy-Easier Posting Box is a child friendly, empowering and meaningful resource that supports real changes and progress for children and young people. Both me and my pupils have seen real change for the better since using the resource as a part of our sessions and their increased progress and confidence has been a privilege to watch.